VOTERS seeking to “stop the SNP” can help the Liberal Democrats do “exceptionally well” in the General Election, the party’s Scottish leader has said. Willie Rennie insisted that people would vote “intelligently” in the 11 Scottish seats the Lib Dems won in the 2010 election. Opinion polls have suggested the Scottish Liberal Democrats are facing heavy losses on May 7, with senior figures such as former leader Charles Kennedy and Chief Secretary to the Treasury Danny Alexander among those facing defeat. The SNP is tipped to win the Gordon constituency from them, with former first minister Alex Salmond the favourite to be the next MP for the area. 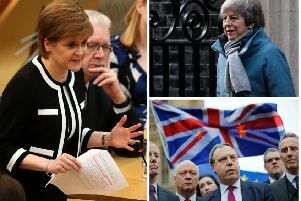 “It is a choice of veering off to the left with massive borrowing with the SNP, or veering off to the right with massive cuts with the right wings of Conservative Party, the DUP and Ukip. He continued: “As Scottish Liberal Democrat leader, I’ll always encourage people to vote Liberal Democrat. I think we’ve got the best programme for the government. “But what I think is quite clear in the 11 seats that the Liberal Democrats hold there is a clear, straight choice between the Liberal Democrats and the SNP. “If people want that moderate centre-ground approach, economic progress combined with fairness, they choose the Lib Dems. If they want to have massive borrowing, massive debts, a burden on the future, then they can vote for the SNP. It’s a straight choice in those seats.